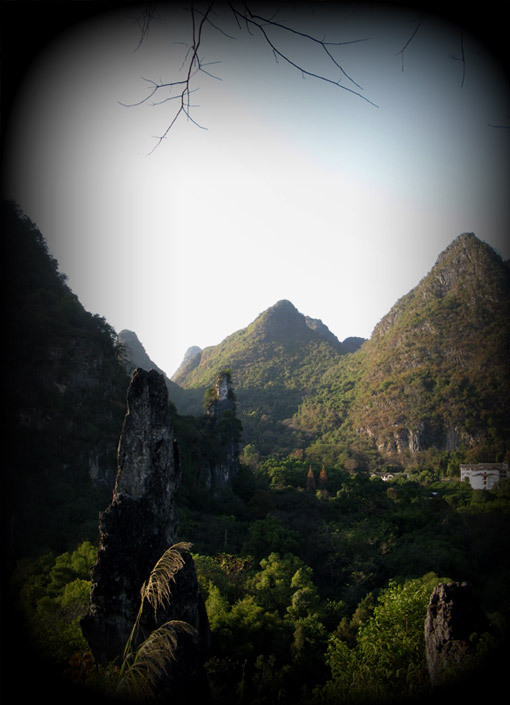 Yangshuo lies in the northeast of Guangxi Province and to the southeast of Guilin City. The special geography gives it breath-taking beauty while over 1,400 years of history bless it with a deep traditional culture. The diverse ethnic minority groups including Hui, Zhuang, Yao and others, enrich it with special folk cultures represented by their various festivals; while many foreign residents add exotic flavors add to its fascination. The famous Li River traverses the county and brings it the most beautiful scenery. Along the extremely pure river, thousands of hills stand in different poses and with different expressions, such as Moon Hill, Mural Hill and Schoolboy Hill which is the natural stage of the world famous opera ‘Impression Sanjie Liu‘. Sanjie Liu is a fairy singer in the legend of the Zhuang minority group. Big Banyan, a huge tree with a history of over 1,400 years, is said to be the place where her love story happened. The ‘Little Li River’- the Yulong River – is a paradise for a cruise because of its green hills, silky water and ancient bridges. You can also go to Xanadu, a primitive minority village full of folk culture and tranquil rurality.